Among the growing uses of digital learning in mainstream districts is the shifting of “snow days” — or other unplanned school closures due to weather or other events1 forest fires, floods, tropical storms, hurricanes, and other natural disasters— with “e-learning days.” In most cases, on e-learning days students access learning opportunities from home. Crucially from the district perspective, these days are approved by the state in some way to count towards attendance and funding. This eliminates the need for the district to add extra days to the school year in case of school closures, or to add days at the end of the school year. To our knowledge, no count of districts that have created e-learning days along these lines exists. We see such days alluded to from time to time, however. One example from summer 2018 explores a district in South Carolina eliminating snow days; another explains how a district in Virginia used virtual learning days to make up missed class time due to Hurricane Florence. It’s not unusual for digital learning advocates to wonder why schools in 2018 even have snow days at all. 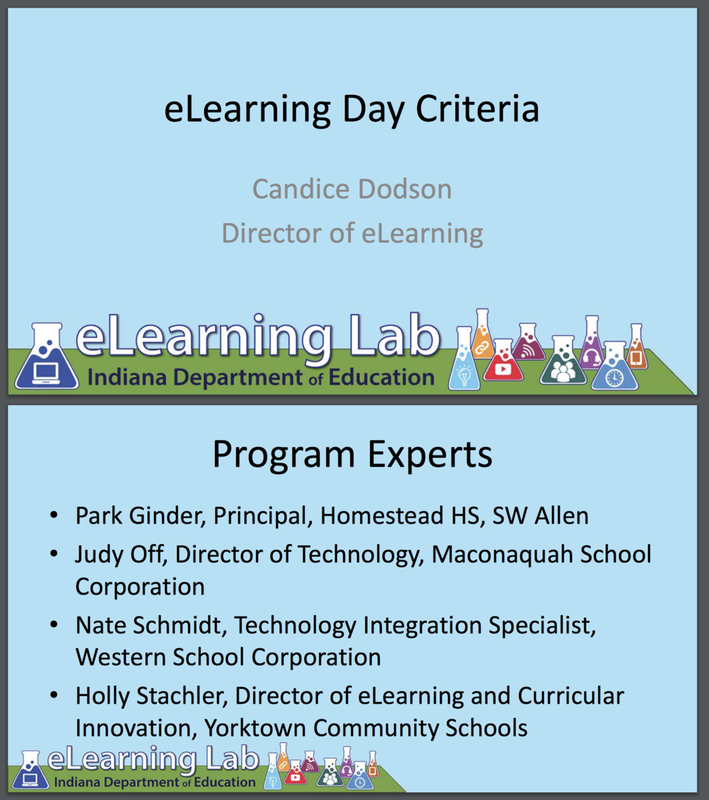 Upon closer inspection, however, it becomes clear that creating the infrastructure to implement e-learning days is daunting unless the district is already using digital learning extensively. In order for an e-learning day to work, the school/district needs to have a place where students e-learning is managed, such as an established learning management system (LMS). Students must have access to a computer, so unless the district has implemented a one-to-one program or “bring your own device” policy, it will have to determine how students will get online. Teachers who are engaging with students in online and blended learning spaces need extensive professional development to be able to provide meaningful learning opportunities in the digital space. Schools and districts also need to clearly communicate with students and parents about the policy that is established so that everyone involved is on the same page about what is needed to support the students’ learning. “Internet Access: Our school corporation can demonstrate access to digital learning for students and teachers away from our buildings. Instructor Access: Teachers will be directly reachable from students and parents to facilitate and support instruction. Platform Experience: All of our teachers and students have access to, and experience using, online platforms and digital resources for learning. Learning Targets: All of our students will be informed of their learning targets for the day by 9:00 a.m.
Work Continuity: Student work will cover content that would have been addressed if school were in session in a traditional setting. Accommodation Support: All students who have accommodations for instruction will be provided with or have access to those accommodations. Offline Support: For students with disabilities who do not use an online platform for learning or for whom an online platform is not appropriate, teachers will provide parents/caregivers with appropriate educational materials and learning activities for student use. Individual Needs: For limited English proficient students, teachers will provide parents/caregivers appropriate educational materials and learning activities for student use per the Individual Learning Plan. Work Measurement: Students will demonstrate time on task and/or equivalent learning growth for the time. In addition to these guidelines, the state offers specific guidance for supporting students with significant disabilities as well as a guide for helping teachers prepare. As of September 2018 a long list of schools has been approved to take part in the Indiana program. Middlebury Community Schools is one example of how schools at various grade levels are implementing their e-learning days, as described here and elsewhere. High school students will engage in their learning the same day as the cancellation. Their teachers will be online to help as students do their work, as long as connectivity is available. Elementary and middle school students will have a number of days to complete their work so that they can have ample time to consult with their teachers as they need to for clarification purposes prior to submitting their work. Other states are allowing e-learning days also. In Minnesota, there is talk of e-learning days replacing snow days completely. Anderson School District 5, for instance, has reported that only one-fourth of their students show up on a snow day makeup day, so there’s little point in tacking the days on at the end of the year. Instead, the students will engage in learning online and will keep their vacation days as planned. In Illinois, the State Board of Education started implementing e-Learning day pilots back in 2015. One of the districts who took part in the pilots was Gurnee District 56. For the rollout of the e-learning plan, they first communicated with parents that they were going to get their staff prepared first and then they’d be in touch with parents so that everyone was fully informed. The most important part of implementing such a plan is the communication with all stakeholders who are involved. E-learning days can be a significant benefit to a district’s digital learning strategy, but like all digital learning must be well planned and implemented. We will continue monitoring developments in this space, in particular watching for any examples of research documenting the success or challenges of e-learning days.